In a recent blog for the World Bank Jing Guo, a member of the group’s Public Opinion Research Group, outlines the ways in which strengthening governance has climbed the agenda of opinion leaders in developing countries. 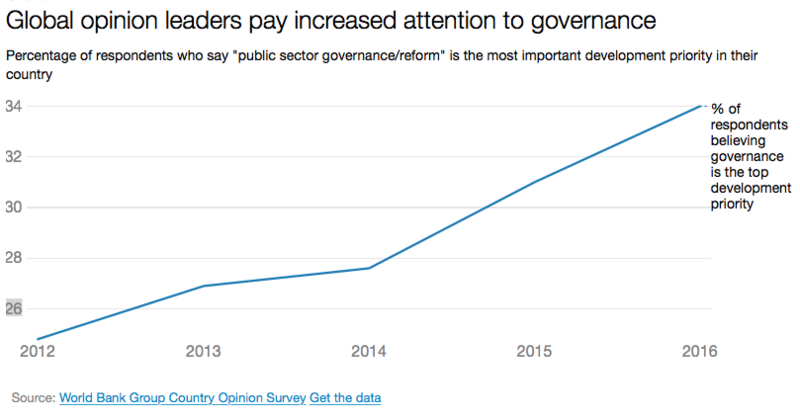 The World Bank’s 2016 poll of more than 35,000 opinion leaders working in government, parliament, private sector, civil society, media and academia in more than 120 developing countries found that addressing public sector governance/reform is now regarded as the most important development priority across 45 countries by many opinion leaders (34%), more so than education (30%) and job creation (22%). This sustains a trend in which concerns over governance have grown substantially amongst this group since 2012. Governance is a huge component of the work we are doing at ESID. Hear from our co-Research Director Kunal Sen below, as he discusses the ways in which governance, politics and economic growth interact. Read Kunal’s working paper on the political dynamics of economic growth.